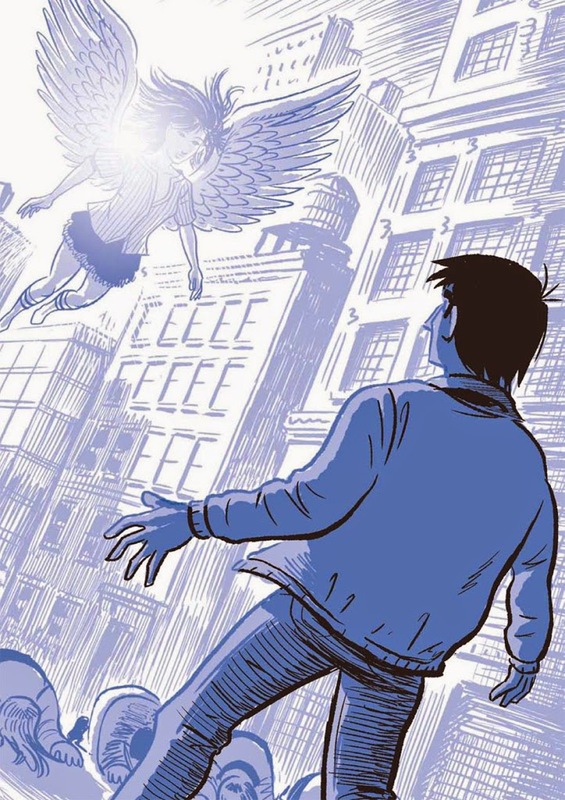 Although Scott McCloud has worked on fiction comics before, it's been a while. He wrote and drew his fantastically unique superhero series Zot! in the mid-eighties, and since then the only major return was writing an arc or two of Adventures of Superman in 1996. What he's most famous for is his work on comics themselves, in the form of the seminal Understanding Comics, Reinventing Comics, and finally Making Comics. These are highly regarded works amongst the comics community; reading the first often marks the beginning of a true devotee to sequential storytelling, acting as a kind of benchmark in fandom. McCloud set a pretty high bar for himself with this series when he set out to return to comics fiction with his massive new graphic novel, The Sculptor, and luckily for him, it mostly holds up to the sort of scrutiny that he brought to the comics world with his analytic books. The Sculptor revolves around the life of David Smith, a young artist who we find at his lowest: the acclaim surrounding his earlier work has faded away, he has no family left, and he's spending his last few bucks on a cheap diner meal for his twenty sixth birthday. The inciting action of the book is a Faustian deal with death: David agrees that for the power to create great art, he will only live for 200 more days. Although his new found powers–the ability to sculpt any material with just his bare hands–grants him artistic ability, he still struggles to deal with the fickle art world and most importantly, the fact that he may have met the love of his life with just a few months to live. The writing is quite strong. David, while not the most likeable guy in every circumstance, is relatable and familiar, especially if you've ever known a fine artist. He's frustrating but inspiring, and his struggles, both existential and tangible, hit a lot of the right emotional beats. It's a massive graphic novel at just under 500 pages, but for the majority of the book it is a page turner; I found myself not knowing where things were going, in a very exciting way. McCloud throws in many different conflicts, from a breakdown in communication with a loved one to the inability to make art that is both crowd-pleasing and truly great. Perhaps most noteworthy is his portrayal of depression, which comes across as refreshingly true-to-life, not using it as a plot device but rather making it a crucial part of character development. The art, too, is perhaps McCloud's best. There's an excellent sense of pacing that subtly draws you into the perspective of David, with things moving along quickly with smaller gutter space when he's excited or scared. The book is two-toned, being in black and white with blue shading, and it looks fantastic. McCloud's cartooning is pretty phenomenal, capturing the moods of each of the characters often with only a look, and particularly important to the book is his rendering of the actual sculptures, which are visually interesting and feel true to both real life abstract sculpture and David's character. The Sculptor subtly plays with storytelling techniques that are exciting and fresh, crafted with the ambition of a young artist but the forethought of a cartooning master. My biggest issue with the book comes with the last act, as David's life is winding down. Things take a narrative twist at this point, and while I wasn't wholly against the twist, it loses a lot of the down to earth-ness that it had up until that point. 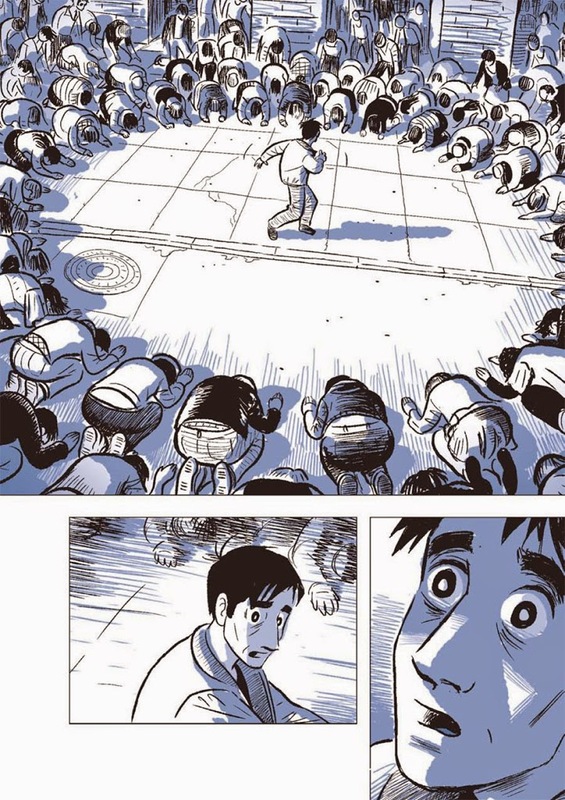 There are moments when it truly shines–a life flashing before your eyes sequence with literally hundreds of panels over ten pages stands out–but the book loses a lot of momentum and latches onto some unfortunate narrative cliches. The ending is not a mess, but it feels rushed and a bit of a misstep compared to the rest of the book, which is plotted with a lot of care and subtlety and has a unique unpredictability. That said, the book tackles some fascinating themes. The Sculptor captures what it is to be a frustrated artist better than most stories, and does it in a way that is visually gorgeous, especially if you're a fan of black and white cartooning. Throughout the bulk of the book, it brings in characters, ideas, and narrative devices that are distinctive and oftentimes quite beautiful. The way in which death is portrayed and explained, for example, and how he shows David the afterlife as a terrifyingly blank page are worth a lot of rumination, and while they reference earlier works (The Seventh Seal in particular), McCloud brings his own visual language to the whole concept. Although the last bit left me a bit less than 100% engaged, the majority of the book had me cancelling plans to continue reading. Overall, it's a major graphic accomplishment, one that is both a compelling page-turner and a relevant meditation on life, art, and love, presented by one of the most important cartoonists of our time. It's certain to be the start of many best of 2015 lists, and despite my issues with it, I can't say I wouldn't consider it among the better graphic novels in the last several years. The Sculptor's careful storytelling and alluring art far outweigh the narrative problems that slowly creep in towards the last part, and in the end, it's a book I would strongly recommend with just a few qualifiers. The Sculptor releases on February 3rd. If you act fast, you can still order signed copies through Barnes and Noble. See ScottMcCloud.com for details on the book tour. 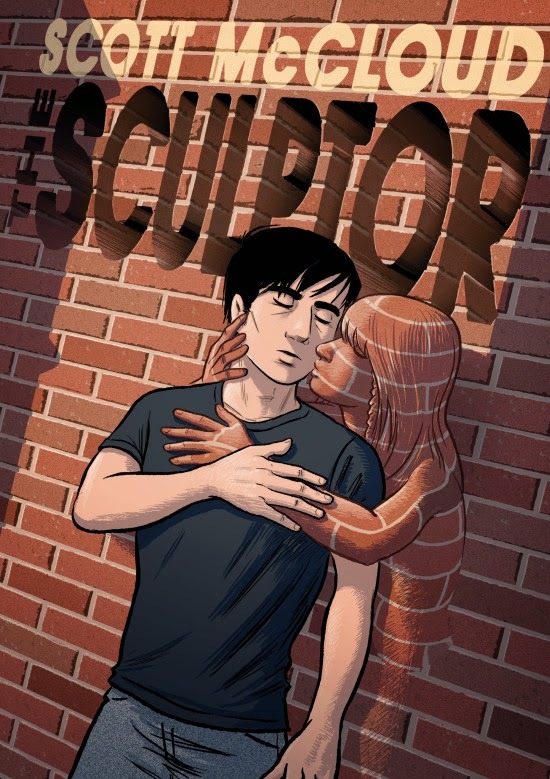 Keep an eye out as well for our interview with Scott McCloud about The Sculptor, which should be posted in the next week!